I’ve been racing the track for 13 years now. I’ve won two master’s national titles (Team Pursuit and Madison in 2010) and I hit the podium at elite nationals in the team pursuit twice. But after a pretty major crash in training in 2014, I broke my C7 vertebrae and cracked a couple of ribs, leading to a lengthy recovery process. 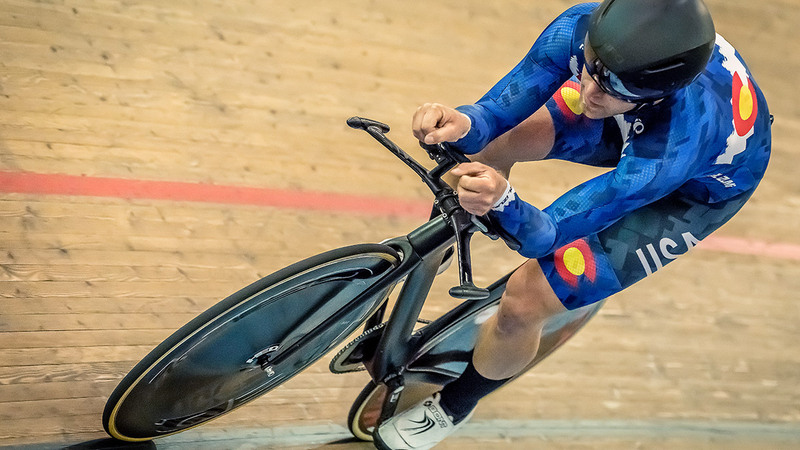 I still managed to compete at Master’s Track Worlds in Manchester in 2015, kicking off a 2-year plan to get myself back to top speed—after all, worlds would be on American soil in 2017 and ‘18. I worked with Boulder-based Colby Pearce to make my comeback. 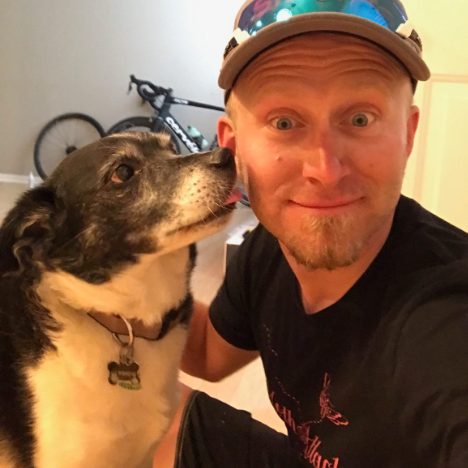 An Olympian and Master’s world hour record holder himself, Colby has experience with nearly every discipline of cycling, is an excellent bike fitter, and is able to advise & guide on pretty much anything I want to take on, even mountain bike racing! 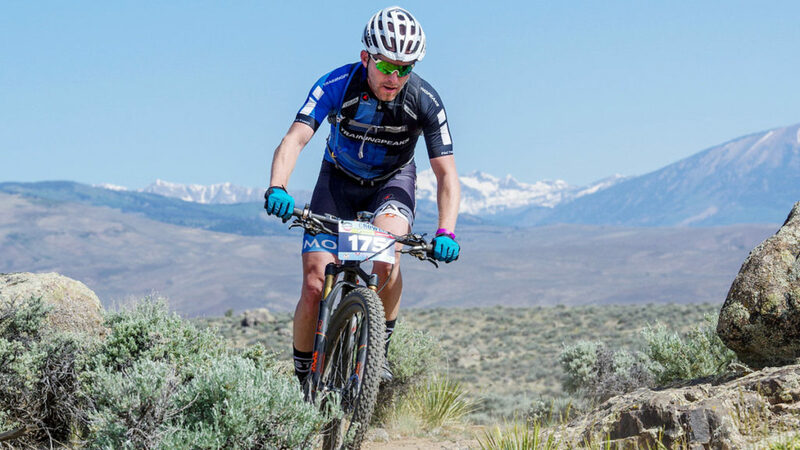 To prepare, I took a somewhat unconventional path, focusing on mountain bike races in Colorado through the spring and first half of the summer. It might seem counterintuitive, but long technical mountain bike climbs can really help develop the mental focus needed to do a 3.5-4 minute pursuit on the track. In my early season prep I got familiar with some cool races including the Gunnison Growler, Firecracker 50, Rocky Mountain Endurance Series races, Dakota 5-0, Whiskey Off Road, Borah Epic, and the Chequamegon 40. As my focus started to turn to the track, I made some very productive equipment & aerodynamic tweaks, with the help of Ryan Cooper from BestBikeSplit. Ultimately I was able to log some personal bests that I never would have thought possible at the 2017 World Championships. Throughout the winter & early spring of 2018, our team (consisting of Jeff Anderson, Lucas Clarke, Mike Zagorski, Ian Holt and myself) trained together once a month at Colorado Springs. Ian trained mostly on his own, as the Air Force has him stationed in California, but the rest of us are based in the Denver area. COS is a super-fast track, and it didn’t take long before we were doing flying efforts at the pace we calculated we’d need to ride at worlds in Los Angeles to make the gold medal ride. Three of us are coached by Colby, so it was good to have his input throughout the process. For the late spring through early summer, the collective focus usually shifts away from the track. Lucas races pro/1/2’s for Primal/Audi, Jeff in master’s for Rocky Mountain Cycling Club, and I was doing my mountain bike thing. 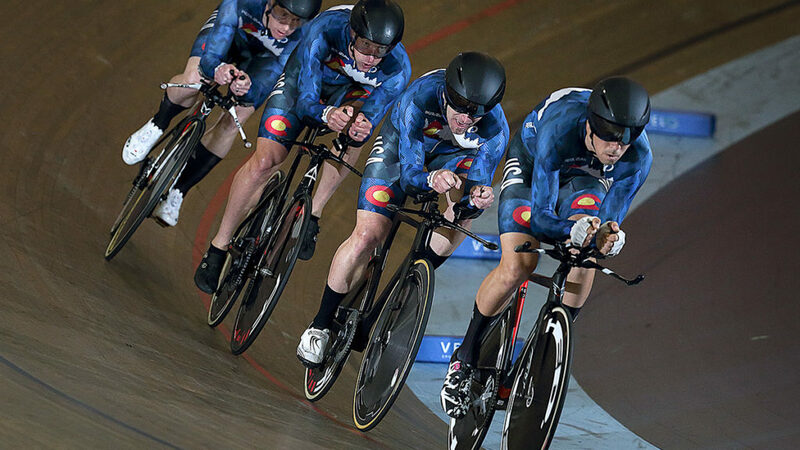 We started to get more serious again in July, doing training sessions exclusively at the Boulder Valley Velodrome and participating in Saturday time trials. 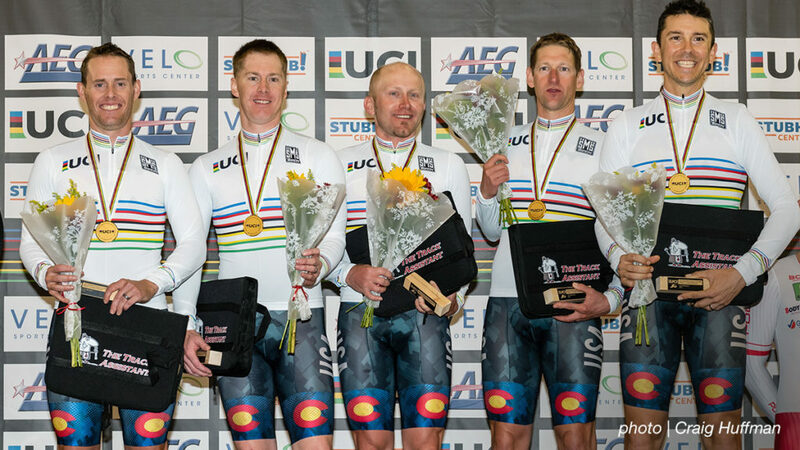 The team won the Colorado State Championships team pursuit (with Mac Cassin filling in for me) riding a 4:39 on a day with massive wind gusts. 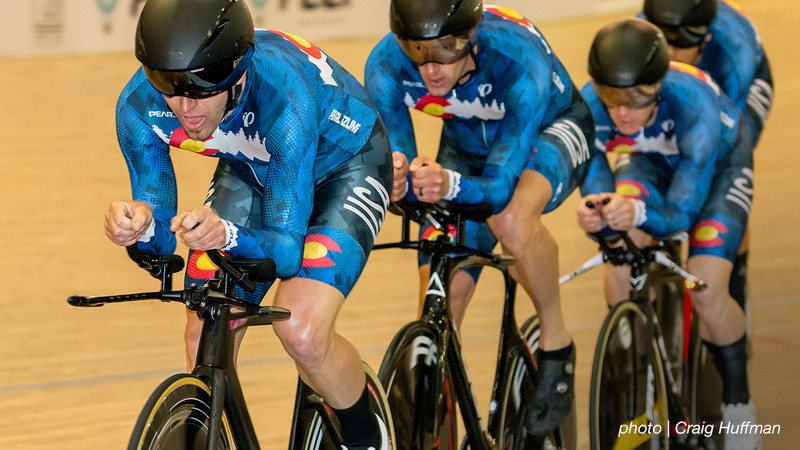 Then, in our last prep effort together before Worlds, we managed a 4:32 4km team pursuit. We made a couple of minor mistakes during the ride, and we knew that the 4:30 barrier would be achievable going into worlds. Early in the week in individual pursuit qualifying, I put down the best average power I’ve ever done in a pursuit, but somehow PB’ed by only 4 tenths of a second (3:37.1) and missed qualifying for the bronze medal ride by 3 tenths. 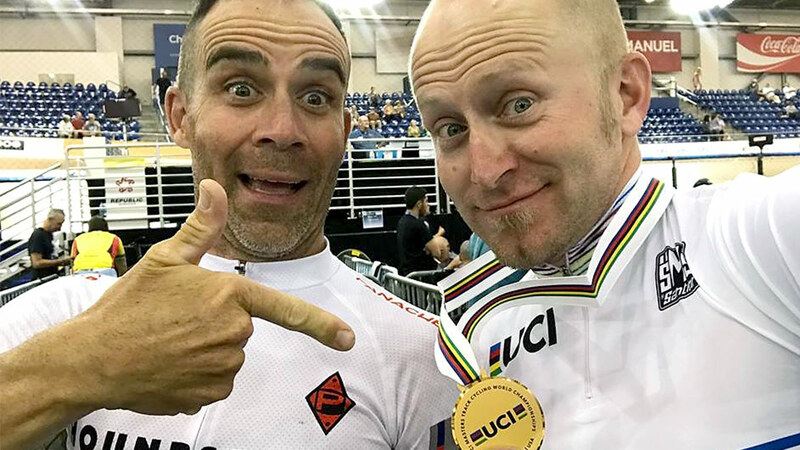 I also had my best-ever Worlds ride in the points race, lapping the field once, winning two sprints and finishing in 5th place (with my team pursuit teammates Lucas and Ian finishing 1-2). Everything was looking good heading into the main event. Our team, “Colorado USA 2”, with 5 total riders, we opted to run our fastest quartet in the finals. Race results identified me as man 5 (in other words, the low guy on the totem pole), so I would ride in qualifying before giving the spot to Ian Holt in the finals. When we started, the time to beat was Argentina with a 4:40.096. We reiterated to each other to just do what we had done in training: no risks, nothing crazy, no mistakes or yard sales and we’d make the gold medal ride just fine. We ended with a 4:30.8, the fastest qualifying time, clearing our way for the gold medal final. I started in the third slot, and was able to contribute with three solid pulls, finishing with the team. For the finals, we knew that the second-placed qualifier (Team USA 1) would certainly have more in the tank than their 4:33.8 qualifying time. After some discussion, we decided to go out on a 4:25 pace and try to raise in the final kilometer. We also modified the pull distribution; Ian came in on double (2 lap) pulls, Lucas (our strongest rider) remained on double pulls, and Jeff dropped from doing 1.5 lap pulls to singles. Mike would again be the starter and ride single pulls. The team came through brilliantly, taking the lead on lap 3 and holding a ~ 2 second gap over USA 1 to take the gold medal, riding a 4:25.1 in the process. USA 1 also rode brilliantly for a 4:29 in the gold medal round, even with a bit of an explosion on the final lap. 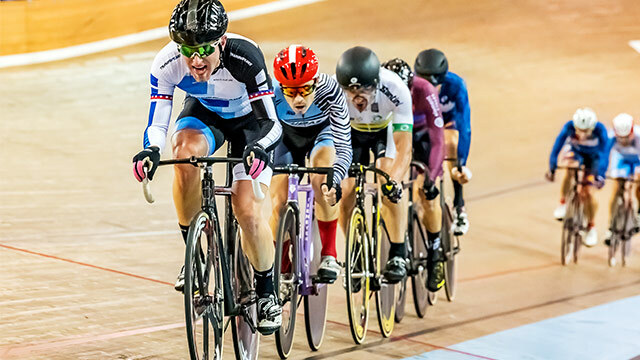 The next day – after a relaxing morning ride, I came into the scratch race final with relatively little pressure on myself for a result. I wasn’t feeling particularly snappy, so I included a ride to the track for the evening session to try and get the body going. About midway into the race, a hard acceleration occurred and luckily enough, I was able to fire up the legs and cross a gap that could have been dangerous. After waiting a couple of laps to see the reaction, I settled in to pursuit mindset, knowing that this was pretty much it. With about 8 laps (2km) to go, I had a little bit less than a half lap gap. The reaction came late, with about 4 laps to go, but I was able to raise my effort and hold off a charge to the line by a couple of bike lengths. Double world champ! Earning two jerseys would have been unimaginable for me four years prior, when the accident made workouts as simple as a 30-minute trainer ride completely exhausting. Without a doubt, I would not have been equipped for such a move without the motivation of being part of a great pursuit team, and the guidance of Colby as a coach. Andrew Kruse is a Software Delivery Engineer with TrainingPeaks’ sister company, MakeMusic, Inc. He’s frequently found in the TrainingPeaks Pain Cave and on the company lunch rides. He has raced road, track, cyclocross, mountain, and fat bikes over the course of 23 years and while he's been most successful on the track, he finds himself having the most fun on mountain bikes. When not slinging code or pedaling, Andrew can be found on the slopes, traveling, and enjoying life with his wife, family and friends.